Manfrotto has added depth of field preview, an intervalometer and time-lapse controls to the app that runs its Digital Director camera-remote-control and external monitor device. Version 2.1 of the app, that is now compatible with a wider range of iPad models, also brings auto playback so images can be displayed automatically after they are recorded, as well as exposure bracketing and a more precise focusing system. The new app makes it possible to download Raw images to transfer via Wi-Fi web server, e-mail and FTP, and users can now send processed and resized JPEG files directly to social media apps on the host iPad. Version 2.1 also imports metadata into the desktop version Adobe Lightroom via a plug-in. While the device offers controls for shooting video content it still isn’t possible to play video back through the Digital Director or to download movie files to the iPad. The Digital Director is compatible with 14 Canon EOS cameras and 15 DSLRs from Nikon but the company says that the new depth of field preview function only works with Canon models. Manfrotto has also released a rigid case for the Digital Director as well as a sun shield and a range of frame inserts that convert the physical structure of the device to accommodate the different form factors of a series of iPad models. The Digital Director now has configurations for iPad Pro 12,9”, iPad Air 2, iPad Air, iPad mini 4, iPad mini 3 and iPad mini 2 models, all of which cost $299.99/£249.95. For more information visit the Manfrotto website. 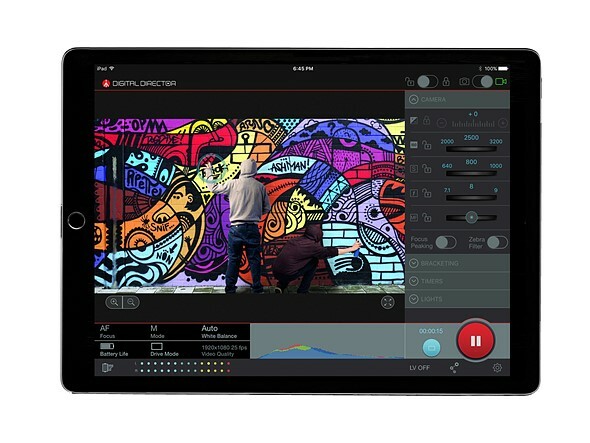 Manfrotto, the leading global innovator and manufacturer of premium photo, video and lighting support products and accessories, announces the launch of Digital Director App V 2.1, new Digital Director models compatible with iPad Pro 12,9“ and iPad mini 4 – and new accessories including a new semi-rigid case, sunhood and frames. Originally launched in 2015, Digital Director won Videomaker’s Best of NAB 2015 and was recently awarded the prestigious Red Dot Award: Product Design 2016. Digital Director is the only Apple certified (MFi – Made for iPad Certification) electronic device that connects your camera and iPad for easier, more effective image making. Just tap the iPad screen to set up and control your camera, shoot, check, edit, share and manage your pictures. Digital Director ensures a reliable USB cabled connection between the camera and iPad, and its free dedicated App allows shoot monitoring and camera setting control. It is compatible with select Canon and Nikon DSLRs and iPad Pro 12,9”, iPad Air 2, iPad Air, iPad mini 4, iPad mini 3 and iPad mini 2. Capturing, editing and sharing all your moments has never been so easy: it’s all just a touch away on your iPad! * Separate frames for the iPad Air, Air 2, mini 2, 3 and 4, and iPad Pro 12.9”. This allows you to easily swap the frames to accommodate different iPad sizes with one Digital Director unit.